GT Avalanche Review. 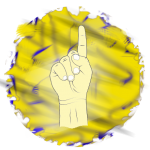 Should You Buy One? You are looking at the flagship of the GT Bicycles. Founded in California in 1972, the Bicycle brand GT has been around for more than four decades by now. Over the years they have produced very solid bikes, designed to compete and off the road. GT Bicycles are clearly noticed by their “Triple Triangle” hard-tail frame design – which is claimed to reduce the vibration from the rear wheel. But, It was the model Avalanche, that has stuck around from the first triple triangle model MTB and it has clearly been the legendary forerunner for the GT bikes. Whenever you spot the iconic GT frame somewhere on the competition, you most probably saw the GT Avalanche. This model is designed to go off-road, so it sure will meet your needs and top the expectations. 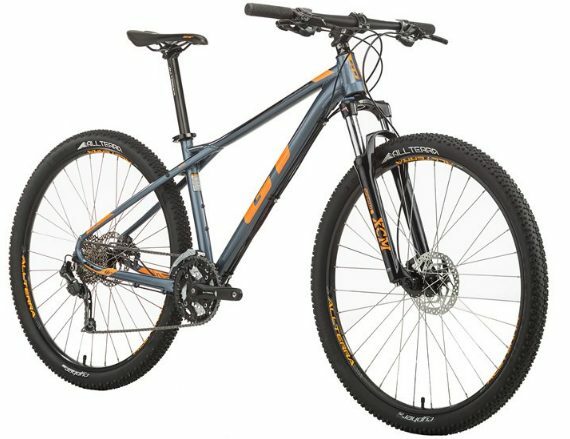 This bike is for the competitive souls, who are looking for the best money-can-buy 29er without breaking their wallet. It’s packed with solid components, that under a thousand dollar bike can have at most. It’s a true workhorse. This model comes in one unique and memorable color scheme: gunmetal silver with a touch of orange. Frame sizes are the usual Small, Medium, Large to Extra Large. 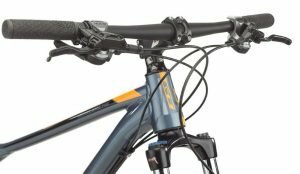 The good news is that the latest 2018 model with 29-inch wheels and 100mm travel Suntour XCM-HLO Forks is the most advanced model to get from the Avalanche model series. This GT Avalanche is something of a MUST to compete in the cross country races. It is designed for all sorts of roads so it performs well both on climbs and descents, on and off the road – you name it! Even going to the pub on Friday or visiting a good coffe store on the cornner. 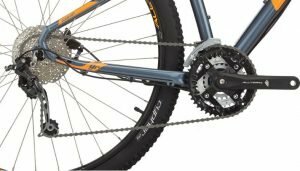 3 x 9 drivetrain will give you a wide variety of gears to meet all your needs when using this bike to compete, or for everyday commuting. Hydraulic Lockout on forks lets you lock the front suspension when you are mainly riding on paved a areas and need to save energy. As this bike is designed for Cross Country use, where breaking is as important as pedaling – braking power needs to be trustworthy. Here you will be taken care by the Shimano Hydraulic disc brakes on both front and rear wheels. The discs are 160mm in diameter, so be careful with the front one, alright. This bike has a stiff and solid feel to it, that will most certainly conquer the trails, and the triple-triangle design will ease off the edgy bumps that will effect on your comfort on many hard-tail bikes. You’ll find the widely used “All Terra” badge on most of the components, Including the saddle, wheelset, stem, seat post, crankset, and tires. The Avalanche is like the name describes – it beholds a massive power. Just be fit enough to maximize its usage! Get this bike! The new GT Avalanche is a heck of a deal when considering all the specs that are provided up here. When you are dreaming of cruising down those Cross Country tracks with a decent bike, I can assure you the bike in your dreams was the latest Avalanche.